Study: People who watch cat videos are shyer, spend more time online. Celebrity Internet cat Lil Bub attends the “Lil Bub and Friendz” Tribeca Drive-In Screening during the 2013 Tribeca Film Festival on April 20, 2013, in New York City. This post originally appeared in The Conversation. According to ReelSEO.com, a website about video marketing, there are more than 2 million cat videos on YouTube. People have watched these videos more than 25 billion times, which equates to an average of 12,000 views per cat video. The statistics speak for themselves, but they don’t tell the whole story. These questions spurred my initial quest to gather empirical data on the Internet cat phenomenon. I scoured academic databases to see what the literature could tell me but found no existing data about why people watched so many cat videos online or what effects these videos might have on us. So I decided to find out myself. 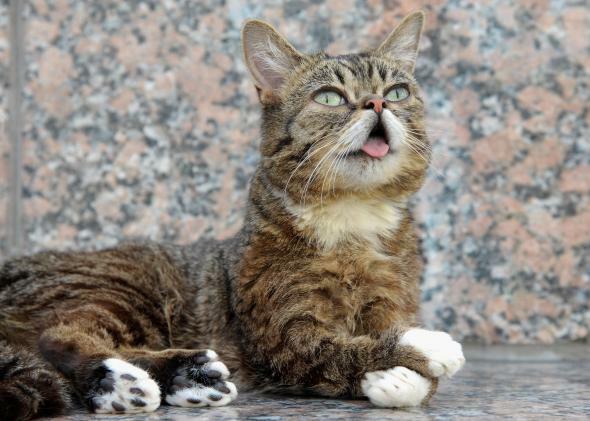 My neighborhood Internet celebrity feline—the adorable Lil Bub, who happens to also live in Bloomington, Indiana—shared the link on her website after I launched an online survey. With Bub’s help, the survey quickly garnered nearly 7,000 respondents. According to my study, if you currently own or have previously owned a cat—or if you’ve volunteered to assist pets in the past year—you’re more likely to watch cat videos. Cat video viewers also spent more time online than other participants, tended to be more agreeable and shy, and felt they had adequate emotional support in their lives. However, emotional stability was negatively (albeit only slightly) related to watching online cat-related media. The data also revealed information about the nature of audience interactions with online cat media. Three-quarters of respondents did not actively seek out cat content. Instead, they happened upon it in the course of their daily Internet use. This means that it’s hard to avoid Internet cats, even if you want to. People in my study reported experiencing more positive emotions and having higher energy levels after watching cat videos than before. They also reported lower levels of negative emotions after viewing online cat-related content. In short, most of us get a little psychological pick-me-up when we watch Lil Bub climb the stairs or view a hilarious Grumpy Cat meme. Well, we now spend more time with media than ever before. If—as my study suggests—part of that media diet includes cute pet videos, then it’s important to know how that specific genre impacts us psychologically if we want to truly understand the role of media use in shaping who we are. Second, media is often criticized (sometimes rightfully so) for harming society—for making us violent, confused about science, or even narcissistic. This study, though, indicates that media use can have a beneficial impact. Even a short-lived boost in one’s mood may help someone make it through a day or charge through an unpleasant task. Because this study was an exploratory attempt to quantify an anecdotally popular activity, I don’t think it should be the final word on the role of pet-related media in our lives. Instead, it should be a springboard for more research. Experiments that use control groups can test different types of cat videos (like humorous, cute, or inspirational) for differences in emotional reactions. Additionally, researchers could test whether digitized cats or dogs can serve as a low-cost form of pet therapy for those who are allergic to real pets.